Our Division Two Game of the Week comes to us from a 2A South conference which looks likely to be one of the most hotly contested in the tier if teams play to form. The 2-1 KCL Regents will clash with the 1-0 RHUL Bears. Both teams are going into this fixture looking to prove their worth, as the Regents look to follow up on a strong 17/18 campaign, while the Bears hope to also build on last season’s strong return. Before we get into it however, it’s worth noting that this fixture is currently in need of some stand-in officials to ensure it’s able to go ahead! If you’re at least a qualified BAFCA Level One coach in the London area, you may well be able to help out! The Royal Holloway Bears began their time in the British University game as the RHUL Vikings, debuting in the 05/06 season. As with many southern/London based outfits, their early years were spent largely in the shadow of the powerhouse Hertfordshire Hurricanes – though they did see a particularly strong season in 2007/8 when they reached the playoffs for the first time with a 6-2 record, and within only a few seasons of joining the league! Consistency has been tough to capture for the Royal Holloway outfit, as a rebrand to the Bears in 08/09 was followed by a number of seasons struggling to stay above water in the BUAFL-era Thames Valley Conference. However, they impressed in 2013/14, putting together their first string of playoff wins on their way to a Challenge Trophy appearance – eventually losing out to a talented Swansea Titans team. They followed this up with an impressive 7-1 record in 2014/15, that saw them placed in the middle tier following the D1/D2 split. A strong run of form continued, and the Bears made it to the semi-finals in 16/17… but Uniball is a fickle mistress, and the offseason hit the Bears hard following three seasons of success – a winless 16/17 season saw the Bears relegated, and a slow start to their 18/19 campaign meant that, despite showing some strong form in the latter part of the year, promotion and playoffs ended up out of reach. And so we find ourselves in 2018, where we haven’t had a lot of opportunities to see the Bears much this year. They kicked things off with a nice 12-6 win over the Emperors, but have since been frustrated to see two fixtures pushed back, the Buccaneers roster issues and a rained off game meaning we haven’t seen Holloways in action since Week One. Again, there’s not been a lot of action to choose from, but certain Bears ballers have begun to shine either in their first fixture or at training. Rookie running back Jack Henley ran for over a hundred yards and a score in his first ever football game against the Saxons in Week One, impressing from the out. Meanwhile, on the other side of the ball, cornerback Ryan Bibby was second on the team in interceptions last season and started this year with two in the Bears’ first fixture. Also in the secondary. Club President and Free Safety Sam Hyde led the team in tackles in the first game and was awarded Defensive MVP. Finally, a duo of American high school players look good on either side of the ball – Harvard Westlake High School’s Olan Moon White on O and Cathedral High School’s Sasha Schultz on the Defensive Line. The King’s College Regents American Football club started in 2008 with just a handful of students in Regent’s park. Roll forward to this season, and the King’s College outfit find themselves playing on a brand new state-of-the-art 3G pitch dedicated to American Football! After a disappointing 0-6 2017 campaign they turned it around and produced very strong performance last season, losing only to one team in the league and playoffs – the Brighton Panthers, who are now playing Division One Football. Ultimately, promotion is the goal this season, and currently tied at the top of the Conference that prospect is well within reach. Even so, the Regents season so far though has been something of a mixed bag of results – with a strong win over Greenwich Mariners, 24-0, followed by a disappointing loss to Sussex Saxons 6-11. Their last game was called off due to the BNU Buccaneers’ struggle with squad numbers, and so the walk over puts the Regents to 2-1. When we reached out to their Team President, Jonathon le Hunte, about their season so far he also admitted that results had been mixed but there are also been a lot of positive aspects to their play, including a strong defensive presence. Also in relation to the upcoming fixture against RHUL Bears, Le Hunte noted that while the team are eager to build upon the success of last season, they’re not getting ahead of themselves and focusing on one game at a time. “We’re going into this game with the same mindset as any other, to win. The Bears are probably the best team we’ll face this year so we’ve been doing our homework as the extra bye week afforded us by the BNU walkfover has allowed us longer to prepare for them. Regents running back, Max Monange, has been the workhorse of the KCL offence so far this season, currently averaging over five yard per rush. However, their star performers so far this year have perhaps been on the other side of the football, as the defensive line have put in dominant showing in both outings. Defensive tackles Samad Fazal and Hassam Kashmiri have been consistent in stuffing the run, holding the Sussex Saxons to barely 20 yards on the ground in Week Three. 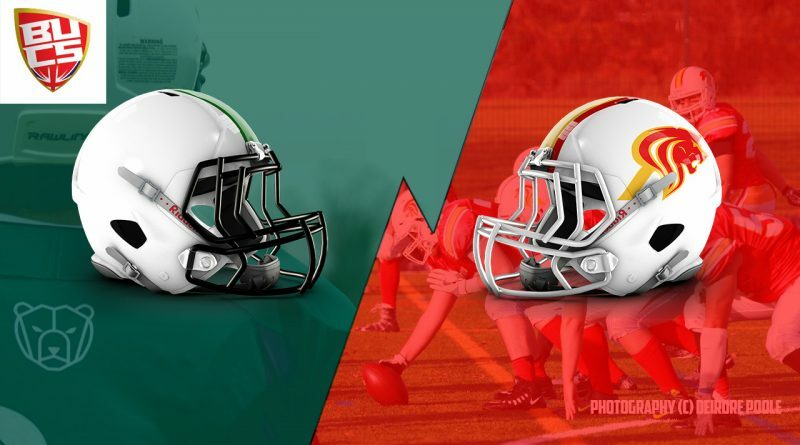 These two teams met last season, and both will consider the fixture an unresolved issue after the game was called in the fourth quarter following an injury, with the teams deadlocked at 6points a piece! Had the Bears found a way to take a win in the closing moments, it would have been them, rather than the Regents, hitting the postseason last year! A much-anticipated encounter between two strong teams that’s too close to call. The KCL Regents will have been on the field more this season with two games already under their belt giving them the slight advantage in terms of game time for any rookies, but potentially meaning they’re also carrying more bumps and bruises coming into the game. Let us know your thoughts on who’s taking the W this weekend, and in the meantime we asked our BUCS office to make their pick of they think have the edge – open the spoiler tab to reveal their choice! Perhaps fittingly, considering the scoreline the last time these two met, our team poll has ended in a tie! “I’m not too surprised to see a split vote here – both these teams have some great individual talents and each could likely hold their own if they were playing middle tier football… which the winner of this game could well be, this time next year!